Summary: We noticed a wonderful change in the yard's attitude towards us this week - they actually seem to like us. Mannop spent hours repairing our compressor (he's quite a mechanical magician) and wouldn't accept any payment beyond parts. Hope the attitude lasts! Cris called our whole team together for a meeting on Monday and translated everything so everyone's on the same page. 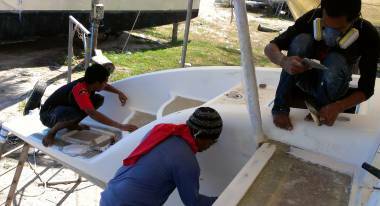 On the bimini, the men sanded and filled the top and the AME team came to finish spraying the gutters and edges with gelcoat. Then our guys flipped it over and started wet‑sanding the bottom, starting with 400 grit. Jack and Chai spent most of the week filling and sanding smaller panels, hatches, and louvers in the newly expanded workshop, getting several ready for spraying with gelcoat. Baw led a team filling and sanding the starboard sugar‑scoop and then masking and spraying it with our ISO 2500 gelcoat. While he was spraying, he also sprayed 5 smaller hatches and covers that had been finished. The team from Luck Engineering finished completely rebuilding both of our aft grab‑rails. Houa fitted the headliners and 2 plastic‑wood boards in each starboard head. He finished shaping the other 3 pieces for those heads, but wants to paint them before installing them. Then he moved over to portside and cleaned it to begin his work there. Sue and Amanda got TMT, who made our tent, to do all of our headliners for us, a big job. Jon ran a test on the mast wiring conduit to determine the force needed to force it up the mast - 286kg or 630 lbs. Several folks worked on the vertical surfaces in the cockpit. They also finished most of the surround for the teak on the aft‑deck. Monday morning! The sun is shining, and things are looking up. After the tensions on Saturday, we wondered how many and which of the team would be around today. But no fear. All but Chai showed up (he was assigned to another boat for the day) and all were smiling. Cris told us the guys will probably work separately from the AME team, but just as the AME team will comment on how well the deck is prepared for the nonskid, so the local team would like some input into the state of the gelcoat that they will be sanding and polishing. Interesting thoughts. Nut, Bank and a new guy, Kwan, were the bimini team. They wet sanded with 150 and 180 all the little Thai gelcoat repair patches they had put down on Saturday. We were rather shocked to see so many little "fix‑its". But what really took time was that they had put on rather a lot of new gelcoat (smeared on with palette knives) and had to sand it down to blend it in. We were sure the whole thing should take only an hour or so, with 3 working, but they managed to extend it to most of the day. This is one of those cases where we understand they are trying to do a very good job for us, but they are just not very efficient, either with time or materials. When it gets frustrating we remind ourselves it's much like herding cats. 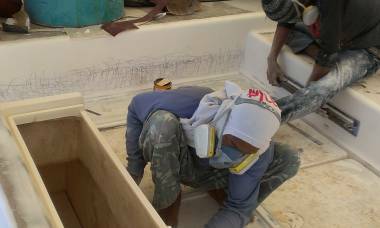 Baw lead a team on the starboard sugar‑scoop, shaping both the outside hull and the top wall. There was lots of long‑boarding, a bit of filler added, and then more long‑boarding. By day's end they had a really beautiful shape, one that matches port very well. Baw would like to spray a layer of gelcoat on it soon to test the shape with a shiny surface. We are inclined to let him do it with "Ocelot White", rather than Thai gelcoat, but we'll see. Just after lunch we had a team meeting, with Cris as the interpreter, and Sue as the discussion leader. We started by apologizing for the misunderstanding about who was telling who to do what on Saturday. 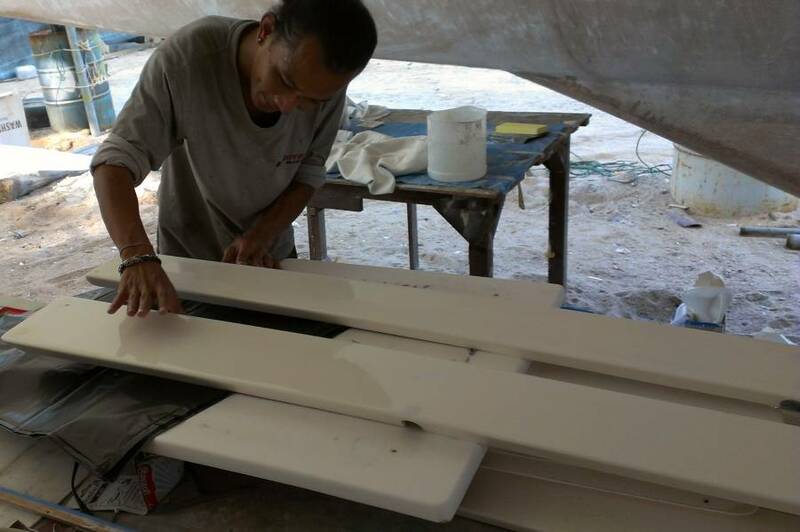 We were the ones who had asked Mike to ask his AME team to tell our guys how they wanted the bimini sanded, because we couldn't communicate the instructions. We certainly didn't intend for anyone to feel put out, or bossed around. Cris wanted a detailed list of instructions we want to pass on to the guys concerning preparing a surface for gelcoating. Most of these came from Mike, but they had to appear to come from us. First we want NOTHING shiny. Not even a fingerprint‑sized spot, as the gelcoat will not adhere. Everything must be sanded until it's dull. We asked that after they apply acetone to clean something, they wait at least 5 minutes for all the residual chemicals to evaporate. They liked our suggestion that they could have a cigarette while they waited. We asked that they be sure to remove ALL of the marking spray paint before putting on more filler in low spots. We have learned that acrylic paint can bleed through the filler and gelcoat in a couple years, just like permanent marker does. We said we didn't want big blue splotches on Ocelot next year! They will now use pencil to mark the lows. We asked them to think about catamarans wanting to be light, and to please not put on any more filler than they need to. This got some strange smiles, probably deserved, as Ocelot is not a feather‑light boat. Once the gelcoat is on, it is up to our team to find and fix the pinholes or other defects (unless they are so big they need respraying). There are 2 ways to do this: You can either finger sand each pinhole, swipe it with gelcoat, let it harden, then sand it and the whole big area, OR you can start by sanding off the waxy surface of the whole area, and then finding the pinholes and defects to fix. Our team prefers the latter option. Our team would like to keep some "ownership" and pride in refitting Ocelot, and we can understand that. Since AME will be doing most of the gelcoating, our guys asked to maybe do the auxiliary pieces, like targa bar hatches and helm‑seat. Things they've been working on, but that don't get non‑skid. Sounds good to us. After the team meeting Jon worked on sanding the bottom of port hull to smooth it out before it gets epoxy sealing. 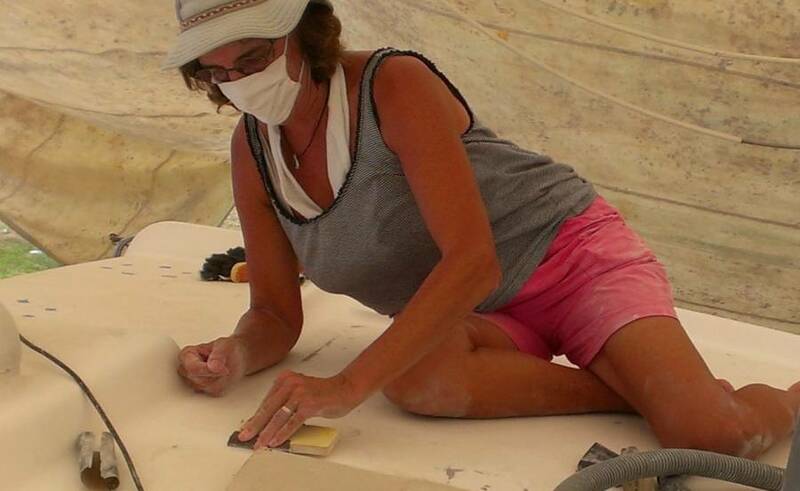 Sue worked on the port fo'c's'le hatch rim, similar to what she did on starboard on Saturday. 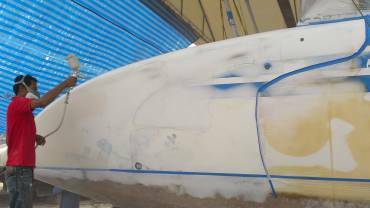 Amanda also sanded the hull, concentrating on shiny epoxy and fiberglass patches which are almost all sanded now. The 2 man team from Luck Engineering was with us again, and spent the day fitting and shaping and welding the port aft grab‑rail, now that the area is finished. At the end of the day we weren't all sure if it was quite the right shape. They will be back tomorrow to finalize that side, and to work on starboard. Jack spent the day in the shade, away from the dust of the boat sanding and filling the hatches that are all out of the boat to be worked on. Houa, happily working outside all the team politics, got several plastic panels for the forward starboard head Sikaflexed in place. 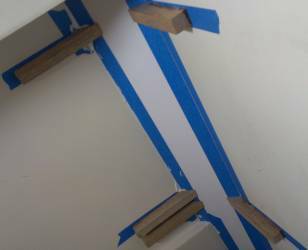 To hold the boards in place without fasteners, he put masking tape on the walls and super‑glued specially prepared holding blocks to the tape. This let the blocks hold the panels securely, yet they can be removed easily by simply peeling the tape off the wall - a very cleaver idea! 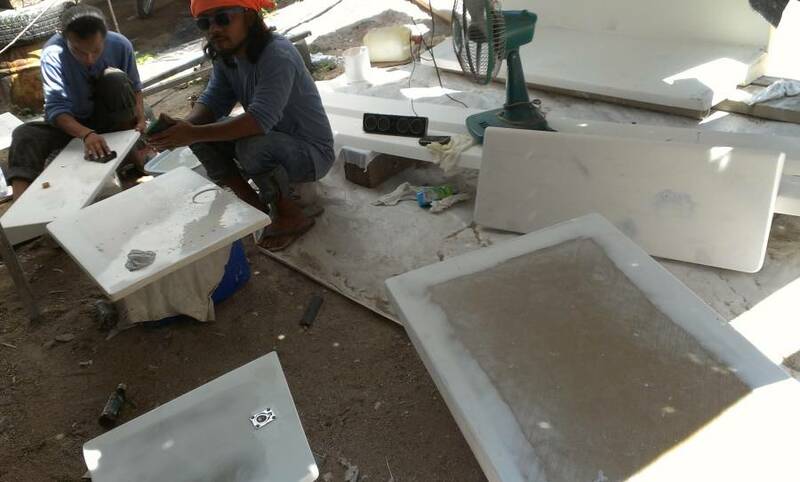 We chose to use white Sikaflex 291, a polysulfide adhesive sealant, to hold the panels in, as Jon would like to know he can cut them out if need be, without destroying them or the surrounding bulkheads. Once the Sikaflex cured, the holding blocks and their tape come off easily, with the panel securely held in place. It's going to be lovely! A good day - at least, we hope so. The big news today happened at the end of the day. After much sanding and masking, Baw shot several layers of gelcoat onto the starboard sugar‑scoop AND 5 smaller panels as well. It was after lunch when Baw told us he wanted to shoot some gelcoat. We gave him the go‑ahead, and told him he could use our good gelcoat. So while Baw and his crew were masking off the starboard sugar‑scoop, Jack started hanging up some of the smaller bits that he'd finished preparing - the 2 small aft cockpit doors, the 2 targa‑bar panels that hold our outside speakers, and one of the upper targa‑bar panels that holds a cockpit light. These were strung up on a rope just aft of the starboard sugar‑scoop, suspended in ways that let us spray everything necessary. Baw started by shooting the 5 smaller panels, sprayed 3 coats on all sides. There was almost no wind today so no dust and little chance for overspray. Then he started spraying the steps and inside of the sugar‑scoop before spraying the back and sides. But the shoot was not trouble free. Although the compressor started up relatively easily the first time, someone shut it down for a few minutes in the middle of the shoot and we had a lot of trouble getting it started again. We need a reliable compressor, so Jon talked to Cris to see if the yard owners could find us another cheap engine. Their reply surprised us - they said if we dragged it over to their workshop, they'd fix it! Sweet! The other problem was that the gelcoat was taking much longer to harden than we were expecting. 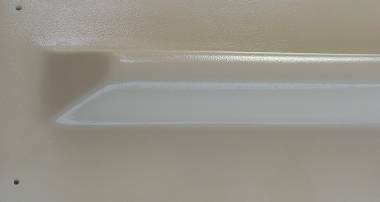 Gelcoat, being polyester based, usually hardens up in 15‑30 minutes. In fact, it's often hard to shoot wet‑on‑wet, as it cures so quickly, but this was still quite wet after 30 minutes. Sue and Amanda left the yard at about 4:30, but Jon stayed until 6 and they were still spraying. Baw insisted that there was no problem and that the gelcoat would cure. We certainly hope he's right. I guess we'll see in the morning. Jon left Baw with a few extra dollars for the men who were working overtime, and also gave them each a beer when they took a break. The 2 men from Luck (actually, LKC) Engineering came back and worked on the grab‑rail for the top of the port sugar‑scoop wall. They ended up almost completely remaking the rail, but it looks much better then earlier attempts. That wall has an increasing curve to the side as you go down, but a decreasing vertical curve, so it's a pretty complex shape. When Baw setup to spray, the Luck team moved out onto the grass to do their final welding. 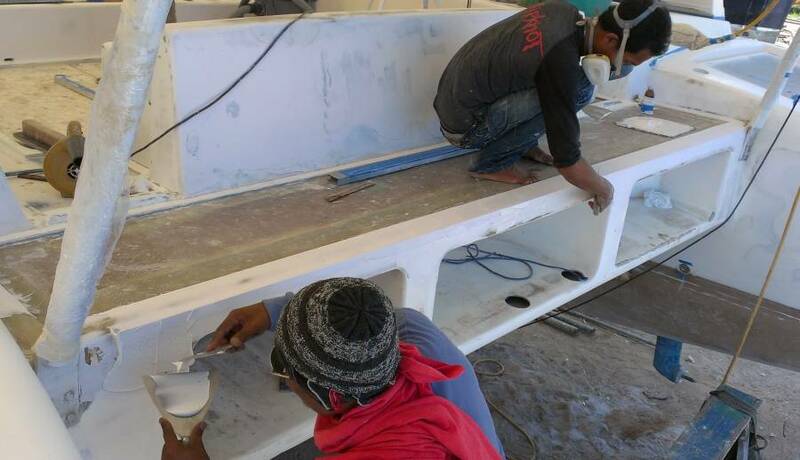 They'll do their final polishing at their shop, and come back tomorrow to do the starboard wall (which is why Baw had to stay late to finish spraying the starboard wall). Sue and Amanda spent much of the day talking to folks about our headliners, which are textured vinyl over thin foam and wrapped around thin plywood. 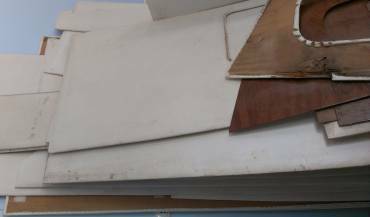 We've been unable to match our old vinyl, so we'll probably have to replace all of the vinyl, a huge job as there are over 50 pieces. We've found some vinyl that's close and we've bought a roll of it, but it's brighter than our 17‑year‑old vinyl and has a subtly different pattern, so it wouldn't look good next to an old piece. If necessary, Amanda can set up shop on the porch of our nearby storage unit with our small electric compressor and the air‑powered stapler we bought, but we're hoping it's the kind of job that Thais can do pretty cheaply, as Amanda has lots of other things she can do for Ocelot. Houa continued installing bits of plastic wood into our heads (bathrooms). The plastic wood is a somewhat brighter white than the gelcoat in our heads, but perhaps we can polish the gelcoat so it will be a closer match. Chai was back and seemed as jovial as ever. He's quite the live wire, and we're glad to have him back as he keeps everyone smiling. Jon pointed out 7 spots on the top of the bimini where he could feel a bit of roughness or an uneven surface, and Chai had them all sanded smooth by mid‑afternoon. Jack and Chai spent the balance of the day in the workshop, preparing the smaller pieces for gelcoat. The rest of the team spent the morning sanding the vertical surfaces in the cockpit, and then masking things off for the Big Spray. Another bright, hot Thai day, but a bit too spicy for us. Wild and crazy at the yard. We had our contingent of 7 of E‑U's workers, plus Baw and Houa, plus the team from Luck Engineering, a visit from a canvas shop, and finally Mike and Deng from AME. Yikes!! It all was happening way too fast. First good news was that Baw's gelcoat spray from yesterday all hardened up nicely, save a bit of overspray on the sugar‑scoop steps. It looks quite nice. First bad news was that we learned, too late, that our new special Ocelot White gelcoat (manufacturer unknown) already HAS mono‑wax (or equivalent) in it, so that when Baw put the wax in the final coat, it was doubled up. What effect this will have, and why the first few coats did not harden up, remains to be seen. We are learning a lot about gelcoat and the spraying of it. We have two different systems going. Baw uses a relatively small 1.4mm nozzle spray gun, less which is the size normally used for 2 part paints. When using it for gelcoat he has to thin the gelcoat with lots of mono styrene to get it thin enough to spray through that gun. This results in a more self‑leveling layer, but with more solvents that need to escape. That is probably why his first couple layers stayed wet so long. Then he added mono wax to the last coat to get things to harden. We just hope we don't have a "crust" of hardened gelcoat over 2 layers of soft, un‑hardened gelcoat. We will be testing, probing, and checking in the days to come. Up on deck there was a flurry of activity as 5 guys sanded and filled around the edges of the cockpit. It's nice to see Ocelot taking real shape again. 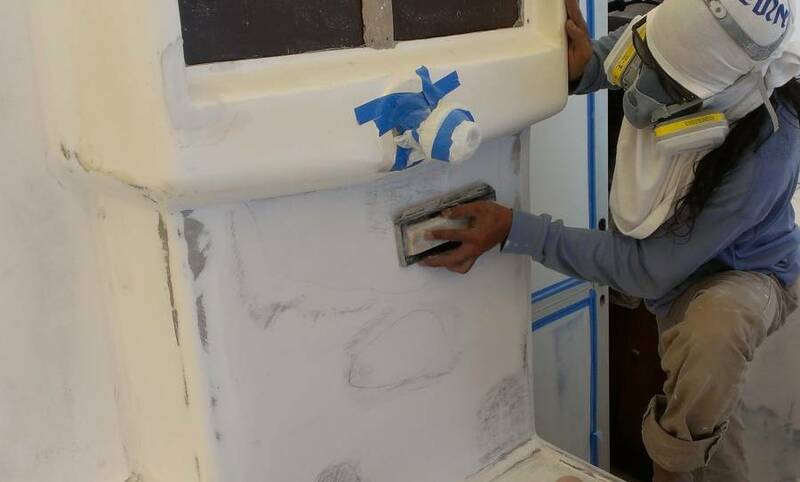 We think the team wants to spray a "throw‑away" layer of gelcoat on the new cockpit vertical surfaces to see how well they got faired, but we are hesitant to have more gelcoat than necessary put on. We have, after all, contracted with AME to spray the cabin top, decks and cockpit. If things look a bit hollow or bumpy after their spray, we can fix them then. At least that's one thought. Jon worked on the mast rewiring project. We have a PVC conduit to go up a T‑shaped track inside the mast. Each individual 4m (13') section has been run up the mast all the way to the top, but we've never run the assembled 60' (18m) conduit up, and we're not sure we can. 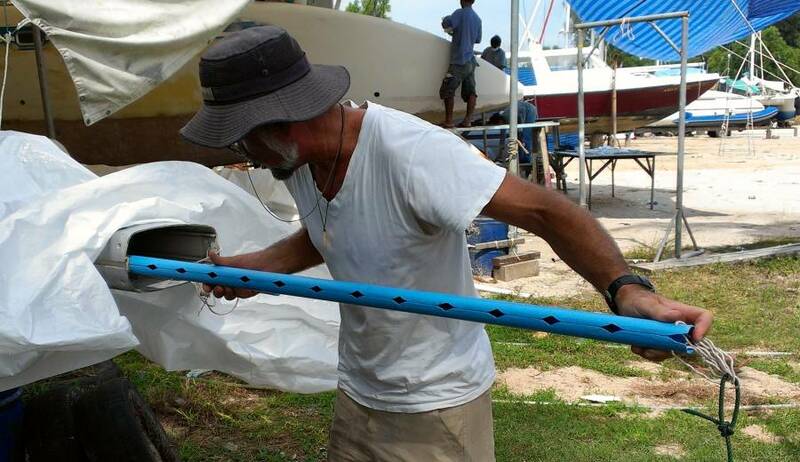 The problem is that the conduit has to bump over the bolts that hold our mainsail track on. They're 10cm (4") apart and that takes a fair amount of force. How much? Good question. So Jon found a test section of PVC pipe with 14 diamond cutouts for the bolts. He tied it to ropes on both ends, lubricated the T‑track with detergent, and started pulling it up the inside of the mast. When the pipe got to the sail‑track bolts, he tied the rope to a fish‑scale so he could measure the amount of force needed to pull it over the bolts. The average was about 20kg (44 lbs) but a few bolts required 25kg (55 lbs) of force. The full section has to go over about 160 bolts, or 11.4 times as many as our test section. So it should require 11.4 times the force, or a maximum of 286kg or 630 lbs. A fair amount of force, for sure, but we can pull it up with one halyard winch and push it up with another (by tying a rope around the bit still hanging out the bottom of the mast). We can also tap on the bottom of the PVC pipe with a hammer and a block of wood. Those impacts should help pop the PVC over the bolts, especially if there's already a significant force being applied. If we can get the whole length of the T‑track well lubricated with detergent, it should be possible. Hoau was seen quietly crawling in and out of the starboard emergency hatch to access his work in the heads. Smart guy. This keeps him out of the way of the dust, wet filler, and paraphernalia of the sanding team. 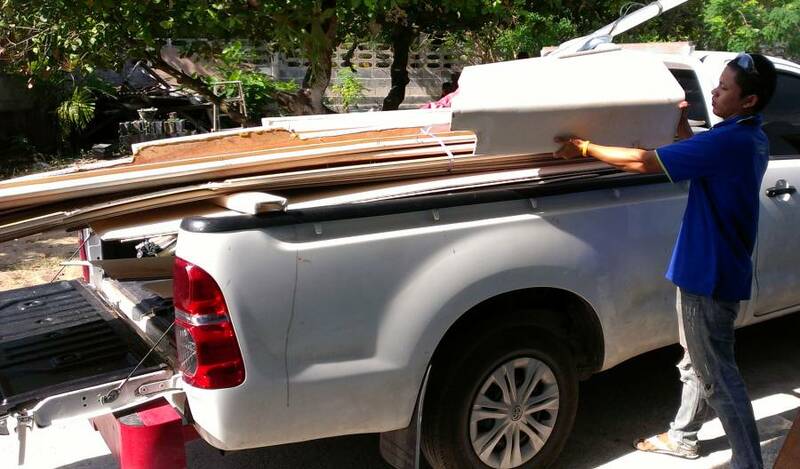 He was seen carrying bits and pieces of plastic board, including the new headliner for one of the heads. Things are moving. Sue spent an hour in the morning fairing in the line of Thai gelcoat to the prepped cabin top, a hot, dusty job, but someone has to do it! The rest of the day she, Jon and Amanda ran errands and ran herd on the workers. Chai and Jack stayed out of the way in the shade of the work shed. They had the fun of wet sanding the newly gelcoated cockpit doors and some of the targa bar covers that Baw sprayed yesterday. They start with 400 grit wet sandpaper with "sunlight" (Thai detergent) on the flat surfaces, and 600 on the external curves. Then they'll move up to 800, 1000, 1200 and even 1500 grit before polishing. Did we say gelcoating is labor intensive? The team from Luck Engineering came by again and after much grinding, fitting, bending and welding they got the final shape made for the starboard handrail. They left at 5pm to take the finished handrails back to their shop for polishing. Ocelot will look so spiffy with shiny rails back there! 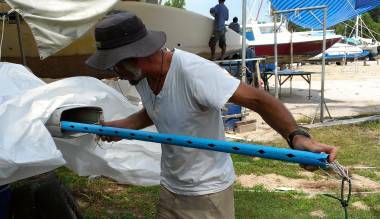 At 3pm Mike and Deng arrived from AME for the final spray on the bimini top gutters (the area around the future nonskid). We had a bit of a set back when we realized our team had used up all the AME mono‑styrene in yesterday's shoot, probably because they put so much in to thin the gelcoat for the smaller gun. New policy: We've got to be sure that the supplies from each team are kept separate, and that everyone honors that. It's pretty expensive for the AME guys to drive all the way from Boat Lagoon, so if they get here only to find they don't have the supplies they left with us, that's not cool. It was finally decided that they would use the mono styrene that we had in our supplies. It might be the same exact chemical or it might not. Time will tell. And if it's a problem, we hope to learn about it sooner rather than later. The gelcoat shoot went well with our old compressor, until, POP! Silence. Wouldn't start. Mike was thinking, "repeat of last time", which is why the bimini wasn't finished last Thursday! Luckily we got the use of the yard compressor in time to save the shoot, and at 6pm the last of the second coat was on, wet‑on‑wet. Jon, Sue, Mike and Deng hung about for half an hour to be sure it was getting hard. Of course the wait wasn't all bad, because thanks to Ocelot's fridge, the beer was cold! Two‑thirds of Team Hacking was out with Bangkok Belly, so Sue got to hold down the fort for the day. It was another busy day at the yard. We are leaning heavily on Baw to play the role of "team leader" but our communication with him is pretty rudimentary so we really appreciated Cris coming by to help make sure we and Baw were on the same page. Top of the list is to get the bimini sanded on the top and polished on the bottom so we can mount it soon. Baw assigned 2 men, Bank and Kwan, to that job. Since this is sanding the "almost" final coat it was important that they not go through the Ocelot White gelcoat. Bank spent most of the day working only on the flat areas, which is good. Kwan, with more experience, worked on both the curved rims and the flats. Sue spent several hours helping out on the curves, being sure not to sand the external curves too much. We are using 400 grit, and will stop with it for now until the non‑skid is put on and the final gutter spray happens. Although we tried, we didn't quite get it finished. Once the afternoon sun hit the gelcoat we could see all the dotty fine areas that still had shiny spots. More work for tomorrow. In conjunction with getting the bimini ready for mounting, we need the targa bar polished as well. When we asked Baw for a couple men on the targa he suggested that we wait a couple days, because he and Lek and Yoong wanted to finish all the fairing and filler work in the cockpit. They can't have people wet sanding above them while they put on filler. Nice to see Baw working out the correct order for the work. We were happy to see Lek, Yoong and Baw all working on our cockpit vertical surfaces. Baw felt pretty sure they would finish today, but it's not quite there yet. A nice accomplishment today is that Baw created the surround for the teak on the aft‑deck. The old one was ground off long ago so we printed up photos of how it used to look so Baw and Houa could work out how best to put it all back, especially getting the levels right so that water drains off. Our original didn't drain well. Houa had the hot, sweaty job of squatting all day long in the heads fitting the plastic panels -- 5 per head plus up to 2 headliner pieces, and all with fiddly shapes that vary slightly from head to head. We also are relying quite heavily on Houa and his ever improving mastery of English. Chai and Jack were back in their work shop area again. We didn't get an update on the hatch work, so that's something to do tomorrow. Seems like they should be finishing up with the pieces Baw sprayed with gelcoat, and have the others just about ready to spray. A good day at the yard, but Jon was still out, and Amanda only had energy for half a day. Sue and Amanda greeted the workers at 8:30 and had some quiet time to examine the bimini top gelcoating job. We could see that we didn't quite finish the 400 grit sanding yesterday, as there were many small areas with shiny bits showing better in the morning light than they did in the late afternoon light. Or maybe people with younger eyes can see things better? We were all ready to set Bank and Kwan busy on the 400 grit again, but they never came in. One of those strange Thai things, "I think I won't go to work today." Cris, the yard manager, raised his eyebrows when he learned they weren't there, and suggested that maybe people should call in if they aren't coming. No arguments there. Jack and Chai were the hatch kings, once again. We were beginning to wonder how long this whole project would take, but were happy to see a pile of louvers and hatches under Ocelot at the end of the day. These are all ready for their gelcoat spray! Just a few more to go. Yay! The busiest place was the cockpit and aft deck. 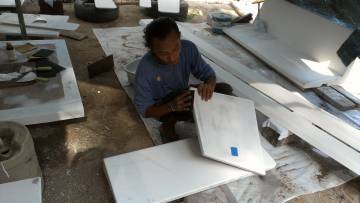 Nut was obviously assigned the task of finding each and every pinhole or defect in the Thai white gelcoat that Baw sprayed on the port sugar‑scoops a couple weeks ago. He was face down to the gelcoat, touching up little places with white filler, letting them dry, and then sanding smooth. Lek mainly long‑boarded vertical walls in the cockpit, trying to give them a final nice vertical (not wavy) look. Sue took a bit of time to help sand out the narrow gutters around the aft cockpit seats, which involved making a tool with a long rat‑tail file, or carefully chiseling out spilled, cured, epoxy from long ago. Sue also spent time with the cabin top hatch rims, digging out the small rings of silicone that the screws had been bedded into. In one place she found a bit of Thai gelcoat that hadn't adhered because it went over a bit of smeared silicone. Nothing likes silicone. Not even new silicone, and Sue is becoming quite familiar with removing the weird rubbery stuff. Houa declared the starboard heads done, except for painting the plastic board under the doors. In the late afternoon he moved his operations over to port side, but with a lot of laughing and joking about all the fiberglass bits he was about to have to clean out. 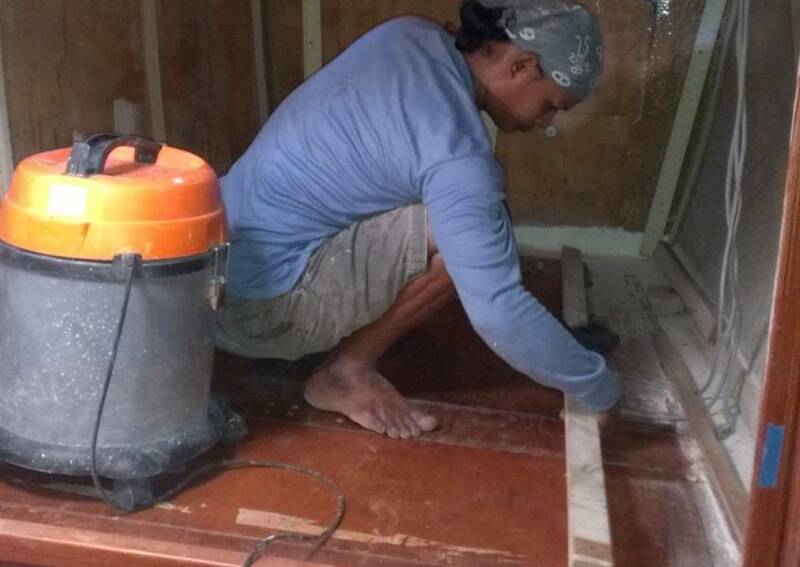 Tomorrow will be an itchy day for him, and a happy day for us to get the boat a lot cleaner and nicer to be in. 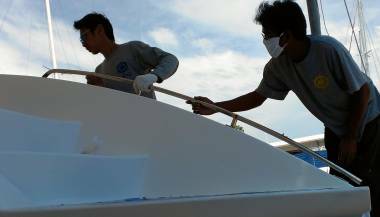 Baw and Yoong worked on creating the polyester and gelcoat trim that will surround the teak on the aft‑deck. This involved creating a new long white border all across the back. It has to be just the right height to hold in the teak, and also to let the water drain off the deck. They also sanded and cleaned down the vertical hull below the aft‑deck, the section that separates the 3 compartments back there. Funny how a small area becoming clean and white can make such a huge difference to the appearance of the boat! Exciting! Mike from AME came by for a few minutes to talk over our upcoming schedule of gelcoating. We will flip the bimini tomorrow and get the guys polishing the underside. We long ago realized it would be very difficult to polish it up overhead once it is installed. 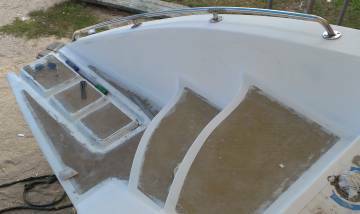 The next area we have to concentrate on is getting the whole cabin top totally ready for the "gutter spray", meaning the areas that will be smooth gelcoat around the non‑skid. We hated to take Baw, Lek and Yoong off the efforts in the cockpit and aft‑deck today, so maybe we can get one of them to do a final check on the cabin top tomorrow. Sue and Amanda scootered out to TMT to get the final count on the headliner pieces, and to help clarify what needs doing to get our 70 (not 50, like we thought) pieces all covered in bright white new vinyl. Luckily, TMT carries the same white vinyl, so we won't have to buy it from another shop again. Unfortunately, in piling up and sorting the panels we found 3 more that were water damaged, so they will be delivered to the yard next week sometime, and Houa will have a bit more carpentry work to do! 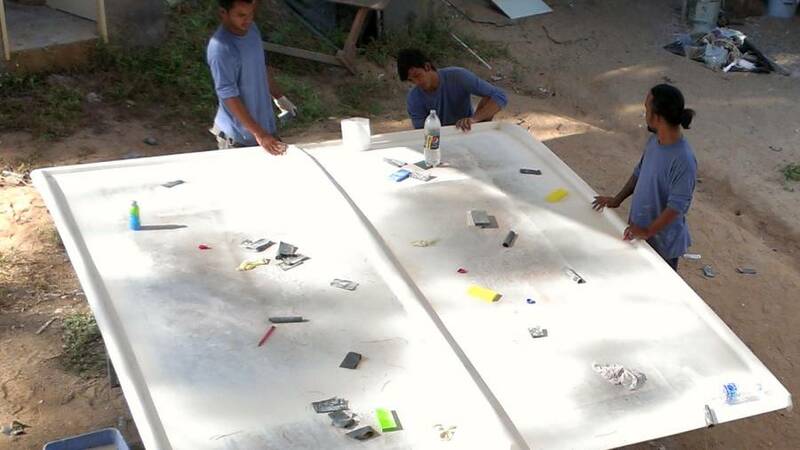 We may use the 5 mm Thai plastic board instead of marine plywood and epoxy coating. We'll have to do an experiment to see if plastic‑wood holds staples well enough to hold the vinyl on. A good end to the week, as we had the full herd of workers again and things moved along. 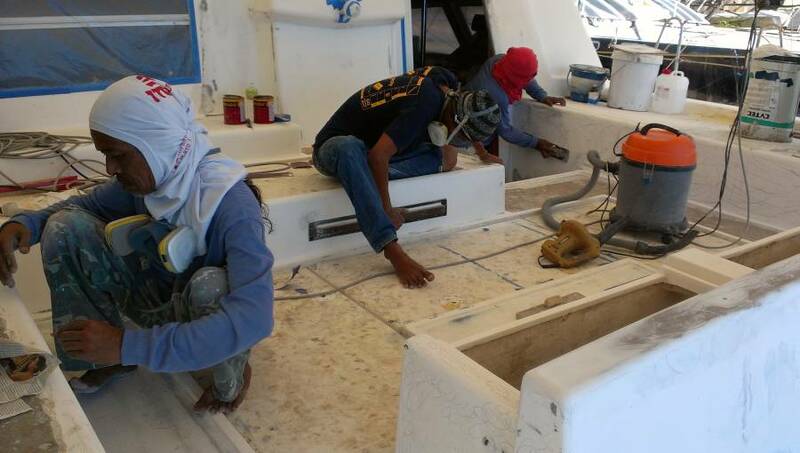 The first job of the morning was to flip the bimini over and set the guys to polishing. Baw asked if it would be sprayed again. "No spray," Sue said. Basically, what you see is what you get, and we hope they don't sand it all away! 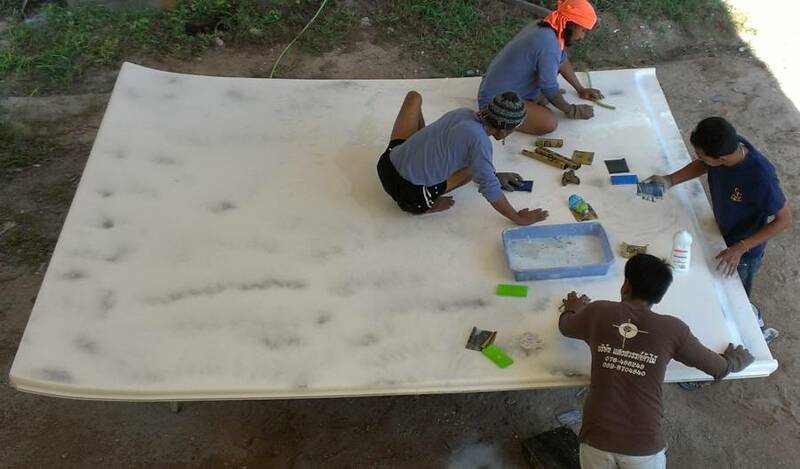 Baw, Lek, Chai and Yoong were the bimini team working the hard ISO 2500 gelcoat from a nubbly new spray to a smooth, slippery surface. They wet sanded with foam pads and water mixed with sudsy dishwashing detergent ("Sunlight") which helps lubricate the 400 grit sandpaper. By the end of the day they were about 80% done with that level of sanding, and the bimini was looking beautiful! More to come next week. Nut was still touching up spots from the Thai gelcoat spray on the port sugar‑scoop. We guess this is to get it as perfect as possible before the "Ocelot White" spray, which won't happen for a couple weeks. We certainly hope he's at the end of this fiddly job, as there will no doubt be small touch‑ups necessary after the final spray! Bank and Kwan returned from their day off to be put on the aft deck and lazarette area. There was a bit more filler needed on the aft deck around the rim to make a gelcoat border for the teak. They sanded the insides of the lazarettes, and Bank used the sanding grinder to take back gelcoat that had cracked (parallel stress cracks). We want to close off 3 big holes that were access points for the hinges of the old life raft compartment cover, which we removed about 10 years ago! Jack worked alone under the work shed tent on the loose hatches and helm seat. He finished the second set of louvers, so they were added to the pile of detached items to be gelcoated. He also got closer to finalizing the second engine hatch which is big, heavy and strangely shaped with a convex curve at one side and flat on the other. Houa was working inside Ocelot on the portside. He finished cleaning up the fiberglass and dust and began disassembling the panels in the forward head. What he found was the same as on starboard -- rotten maple panels which he'll replace with plastic wood. Sue, Jon, Baw and Cris spent time going over the list of what needs to happen to get the cabin top absolutely finalized, ready for AME to come and spray the gutters (areas that will be surrounding the non‑skid) sometime next week. Baw figured 2 days to do the final prep work, but he may have been including some time to figure out the lay‑out of the non‑skid. We know he'd love to do the artistic work on the deck, but it's part of our contract with AME, so we'll be working with them on that. We apologized to him, saying that Jon, Amanda and Sue want to do the lay‑out because it's our safety and sure‑footing that is most important. Amanda had a day in the air‑con apartment where she worked on the layout of the teak and the layout of the non‑skid on the cabin top. And now, Saturday evening at last! Family movie night, and a yummy Sunday brunch to look forward to, assuming the 2 Bangkok Bellies are feeling better!